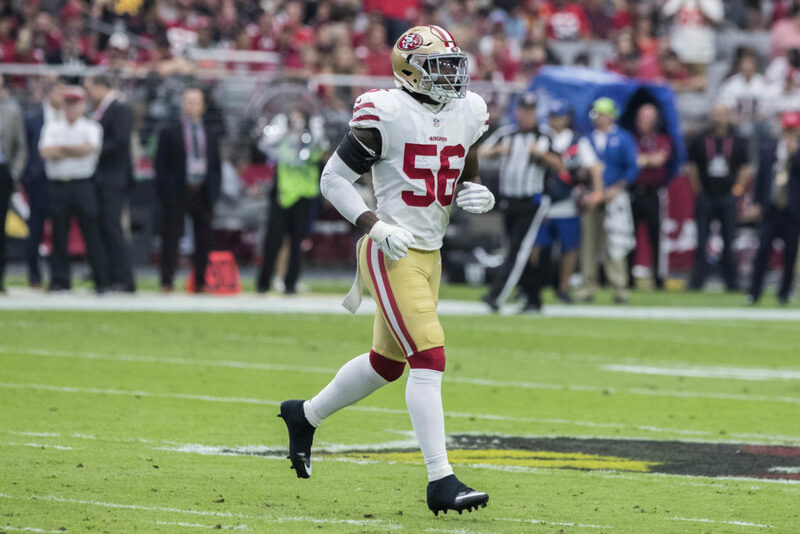 The 49ers announced Sunday morning they released linebacker Reuben Foster. They did not give a statement from John Lynch, Jed York or anyone associated with the team. Foster was arrested and charged with domestic violence Saturday night in Tampa, Florida. This was his second domestic violence arrest this year. The 49ers had given Foster a second chance. He blew it, so they cut him. Good for the 49ers. Glad they quickly made a decision. He was warned. How many chances do you need? I’m glad the team is moving on from Foster. Four strikes and you’re out for better players. 4) domestic #2, too hard to recant, and the seaon’s over, so now we can “afford” to protect Niners image. And what if he’s cleared of these charges? The alleged victim has falsely accused before. All she has is a scratch on her collarbone, which you can’t get from a slap on the face. She could have scratched herself. Won’t matter because we set the parameters for him, and he chose to ignore them. Another first-round draft bust. At least cap space is increasing. First round bust Garnett is twiddling his thumbs on the sidelines. John Lynch should be next. EIGHTY MA BIG SEXXXY BOI!!! Buckner is a great first rounder and one of the few good picks in the past 15 years. He has good character, is a leader of the defense and can play at a high level. Buckner was a Baalke pick. Buckner hasn’t done anything to warrant the 7th overall pick. Far more inconsistent than he is consistent. He’s almost not a bust but he’s definitely not a superstar at all. Four high-pick players, Arik, Soloman and Deforest and Ruben, and don’t have much (relatively) quarterback pressures to show for them. The run stop ability may have improved, but if we track run stats when the game is in doubt vs. run stats in junk time, are the Niners really that good? I’m liking Warner, a lot, and a couple other later-picked players over the premier players taken earlier. Was hoping Lynch would know a good DB pick, and want to see more play out of those picks, not just putting AW out there are hoping. Find out if we have his replacement in hand. Huge character fail. And decision making beyond stupidity. Welcome back to the street corner Reuben.. This is a huge miss by the front office. All other teams saw the red flags but he 49ers made a huge mistake. Someone has to be held accountable for that. Now we need to sign or draft a MLB to pair with Fred Warner. I just don’t see this team turning things around. Do we really trust the Front Office to handle another offseason. Sadly, what real choices do fans have? Perhaps we could still get the banner tug outfit to fly some banners over Santa Clara before the season ends. This was a “free” pick after the trade with Chicago. But, the other picks from that draft – Thomas, Witherspoon, Beathard, Joe Williams – are the one’s that hurt. The 49ers have not drafted well and that’s why they’re a bottom feeder. Right! We need someone that know talent when they see it. All we get is rejects, jail birds and drunks. You go cheap you will get cheap. Bring back Jim and his staff. I respectfully disagree. No such thing as a free 1st round pick. When you keep missing on early picks it comes back to hurt you. We missed on Thomas and Foster and that sets us back big time. It basically continues to delay the rebuild. For us to be competitive next year we need DE, CB, ILB, FS, OG, WR. No. 28 pick certainly is not a “freebie.” Could have got a corner or “Reid-type” safety. That’s why I’d like to have Grant do some objective analysis on the 9er scouting department–there’s more to the selection equation that Lynch and Shanahan. Objective. You really expect Grant to be objective about the 49ers. Wow. Its depressing reading that. Who would have thought that hiring a TV analyst with no front office experience would backfire? Maybe Reuben Foster and Aldon Smith can become roommates and share their domestic stories of how women defeated them without playing a down. Stupid is as stupid does. Off season can’t get here too quickly. Hey, Cassie, did you see that Bama used a helicopter to dry out their field? And we have — five total draft picks this year. In baseball one would say Lynch at 0 for 5 is due. Will be interesting to see if he’s picked up by another franchise–which one and when. I believe the league still has the opportunity to weigh in on this. could severely limit his options… if any. When you have a GM with absolutely no experience, this is what happens. They fall in love with the film, without putting enough weight into character. It’s scary that 30 other teams passed on the same guy that we had as #3 on our board. John Lynch = Trent Baalke. New Boss same as the old Boss. Cannot give JL total blame. They said it was a collaborative effort. KS, Paraag, Peters, Mayhew all had their fingers in the pie. Just as there are quality control assistants in football, I wonder if Grant needs a quality control assistant cleaning up behind him? So who in the 49ers security/traveling secretary staff gets fired ? When have you ever heard of (this is not Super Bowl Week) a significant other of a player being allowed to meet–I’m assuming she wasn’t on the team plane–the player night before the game–on the road—-what the hell ? Good question. And what about any other 9ers who may have been hanging out with Foster? Would love to see security video–all angles. Lynch is giving Baalke a run for his money with his first draft. Will any of those players be in the NFL in 4 years? Good call, I forgot about that one Doh! I could see Beathard bouncing around the league for a few years as a #2 or 3–a la Gabbert, Barkley, and many others. Wouldn’t be surprised if Thomas makes his way around the league as a backup/situational player over the next while too. Foster clearly was a mistake in hindsight as was joe Williams but it’s too early to label the others as bad picks and certainly there are huge successes as well with Kittle and Breida. Others yet to be determined. It is very easy to look at the physical skills and determine a draft order but it is almost impossible to look inside a prospects head and heart and that’s where the failures are. What Linebackers are available in free agency this team needs 2 imo? They have Warner, Smith, Coyle under contract and Lee is an exclusive rights free agent which should be on the low end. They’ll likely add a few guys for competition at the bottom end. I agree Foster was a bad decision but teams make these mistakes all the time. You can’t just refuse to consider anyone who has made a mistake as a young man. You have to make a judgement about their future. That’s the hard part. Foster had no DV incidents in his past, and was worth a roll of the dice in the draft. Happened to come up snake eyes, but so what? We move on with what looks like foundational pieces in Buckner, Warner, Kittle, McGlinchey, and Garoppolo…. None made public. He was in Tucaloosa. Maybe if players like Foster are allowed to smoke pot they wouldn’t be so out of control…..
Maybe if your career means more than pot we wouldn’t have the out of control players. That’s an absurd statement. How about growing up, being responsible and doing your job like most people in this world. No excuses. A good owner would not have hired a completely inexperienced GM. In fact, NO OWNER BUT JED YORK would have hired Lynch to be GM, and there’s no reason to invest energy in supporting an organization with this much incompetence at the top. Jed York is an absolute moron. Lynch is the GM because that’s who Shanahan wanted. They are a team but took a chance on foster and lost. No need to go nuts over this. Oh well, bye bye Foster. GL with your life. Back to football. Interesting line for game. Opened at TB -5, and has dropped over the week to -2 1/2. O/U 54. I think they are right on. It’s going to be high scoring, and close. Weather is perfect, 77 * very little wind. Fast tract! Both defenses will look crappy as normal. Offense will decide this game. how did the 5 or 2.5 spread get covered again when you lost by 18? I had Tampa Bay as a 9 favorite. I got Seattle down for 17 to beat the 49ers by, Wilson throws 350. When the guy at the top of your organization believes MIKE SINGLETARY, and JIM TOMSULA, and now JOHN LYNCH belong at the top of an NFL organizational chart, then you get when you can reasonably expect. Garbage, year-in, year-out. 49ers fans seem highly tolerant of years of ineptitude. 49ers faithful… suckers at this point. Sadly, you may be right. The one common piece in all this is York, who clearly knows nothing about managing or hiring the right talent. The faithful are the ones in the empty seats now. He lost them when the team moved. I won’t be surprised if this consistent self-destructive behavior by Foster may have something to do with his football playing. So far there is no way to monitor the changes in brain induced by frequent head trauma (non-concussive) in the decision-making parts of the brain, but it will probably be available down the road. Anyway, Niners have now moved on, and I am glad Warner was drafted. The 49ers are going to need to address their inability (again) with identifying and drafting talent. This is becoming eerily reminiscent of Baalke. Verdict still out on this years class. Suddenly, we are in the market for a LB come draft day. At least JL accepted responsibility for this fiasco. Grant also ripped the team security, and was spot on. The Foster pick was a gamble at the end of the first round but his upside was huge. I’m actually OK with the pick. To me the worst pick is still S. Thomas at 3. You just cant miss that high. That’s why I say you never can judge a draft class until you are a few years out. This was a big mistake. Going to cost us a lot of money. What a wasted pick that was. I just can’t inagine Rueben Foster without football. Is there any chance he could actually get a real job, let alone hold one for a while. Is he destined to be in an out of prison for the rest of his life? Screw him. The had every chance. I don’t want to hear about all his challenges growing up. Make good decisions. I have plaentynif friends that came from horrible, awful situations that succeed.